Nine people have been injured in a knife attack at a station in the Chinese city of Guangzhou, police say. The attack happened on Friday morning. Police shot one suspect dead and caught another, a statement said. No information was given on the possible motive for the attack. In recent months there have been two attacks on stations in China, in Kunming and Urumqi. Authorities have blamed both on extremists from China's Uighur Muslim minority. But other knife attacks, including on school children, have been blamed on people with personal grudges or mental health problems. 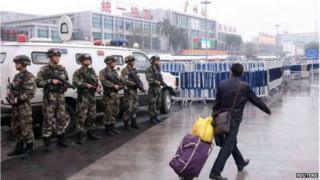 The BBC's John Sudworth in Shanghai says that although the motive for Friday's attack was not clear, the suspicion that it may be political in nature will be reinforced by the timing. It comes just a day after China began its annual parliamentary session in Beijing. The National People's Congress is where the Communist Party sets out its agenda for the coming year. Xinhua news agency said that five victims and the detained suspect were in a stable condition, while four other victims were still receiving emergency treatment. It also ran a a picture posted on microblogging social network Weibo appearing to show the immediate aftermath of the scene with travellers kneeling on the ground and attending to victims. Guangzhou authorities moved in swiftly to establish a tight security presence. The police said on their microblog that "authorities will severely crack down on all illegal activities which harm public safety".